Our FOOD GRADE plastic heat resistant spoons are ideal for stirring in malt extract during boiling and for stirring in the fermenter. 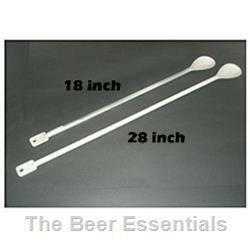 A small paddle on the opposite end of the spoon is designed for fitting through a carboy neck, to allow stirring inside the carboy. Unlike metal spoons, plastic will not scratch plastic fermenters.